Samsung's retail NVMe SSDs, like the 960 PRO, are well-known as some of the fastest SSDs for consumers, but the release of these consumer drives is usually preceded by OEM drives based on similar technology. For example, the 960 Pro is almost identical to the SM961, and the 950 Pro is based on the same controller found in the SM951. 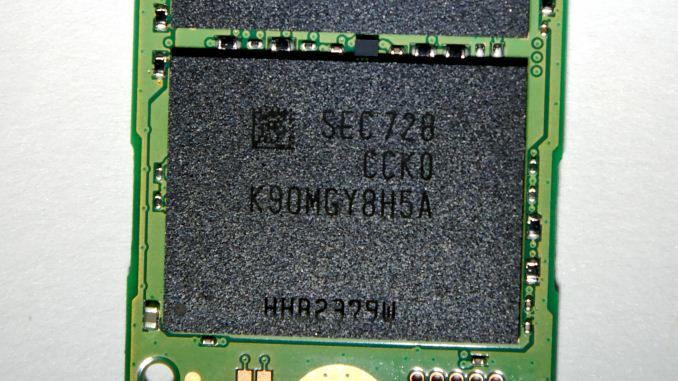 The 971 client series was for BGA SSDs, so for the next generation consumer drives, Samsung is expected to use the PM981 controller and NAND as a base for the design. Luckily, the PM981 is the subject of this review. 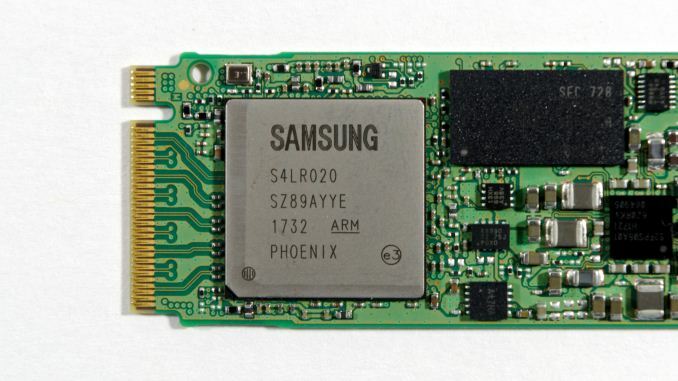 The Samsung PM981 is Samsung's fourth-generation client PCIe SSD, based on the Phoenix controller and 64-layer V-NAND - both of which have yet to show up in Samsung's retail NVMe SSDs. The PM981 offers both a preview of Samsung's next generation retail NVMe SSDs, and a look at what will likely be the fastest storage available in a high-end notebook computer for the next year. The Samsung Phoenix NVMe controller has been making appearances at trade shows all year, mostly in the new hot-swappable enterprise form factor PM983 enterprise SSD that Samsung has been promoting for high density solid state storage. Little has been disclosed about this controller other than its name, Phoenix, but it seems to be an incremental evolution of Samsung's client and low-end enterprise SSD controller architecture. With roughly the same package size as the previous generation Samsung Polaris controller, the Phoenix likely retains the same basic configuration of PCIe lanes and NAND and DRAM channels. When Samsung announces retail products based on this controller we should be able to get some information about what's changed internally to allow for improved performance, but for now, even with our testing, we can only speculate. It is clear that Samsung is taking cooling more seriously this time around with a metal heatspreader on top of the package, similar to what i's used on the Silicon Motion SM2260 controller. Samsung has previously used copper foil in the drive stickers to help dissipate heat, so this marks a step up in attempting to cool the controller. 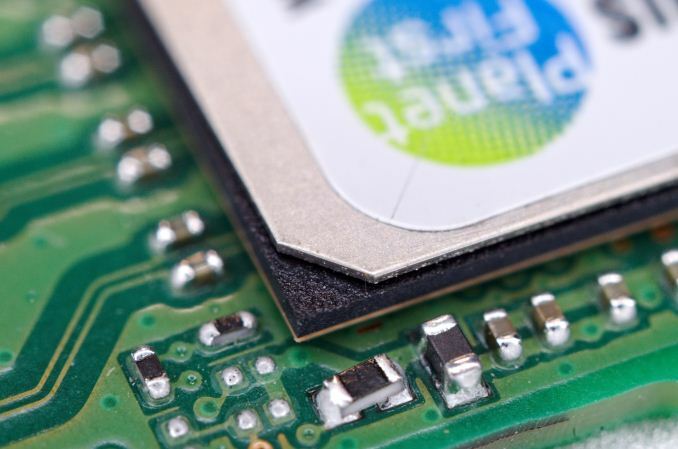 Other M.2 PCIe SSD vendors have used that tactic and many have also released drives with more substantial heatspreaders or heatsinks in the future. The 64-layer 3D TLC NAND Samsung uses in the PM981 has been gradually rolling out across their product lines this year, starting with the Portable SSD T5. Earlier this week we took a look at the Samsung SSD 850 120GB, a new model SATA drive that has been released in the Asian market. The SSD 850 also incorporates the 64-layer 3D TLC, but the small drive capacity and SATA interface were both limiting the extent to which we could measure the performance improvements the new NAND enables. With a per-die capacity of 256Gb (32GB), it is not that much of a challenge for Samsung to make the 1TB PM981 a single-sided drive by stacking each of the packages with 16 NAND chips each. The 512GB model uses 8-high stacks and is about 0.4mm thinner as a result. The model number stenciled in the circuit board indicates that Samsung does not plan to use this layout for anything larger than 1TB, so if a 2TB model shows up it will probably use a denser layout of four packages rather than switch to 512Gb NAND dies. PM981 Phoenix 3D TLC 980 Evo? Samsung's OEM client PCIe SSDs are usually not an exact match for the retail products of the same generation. Their first-generation XP941 used a PCIe 2.0 interface with AHCI instead of NVMe, and never got a retail counterpart. The SM951 and PM951 used planar MLC and TLC respectively, while the later 950 PRO used Samsung's 3D MLC NAND. The SM961 also seems to use planar MLC for its smaller capacities, though the TLC-based PM961 is entirely based on 3D NAND. The Samsung PM971 is an entry-level BGA SSD that may not get a retail counterpart, and if it does it will not fit into either of the existing 9x0 PRO/EVO product tiers. Based on the model number, the PM981 could be expected to serve as a preview of a 980 EVO product. However, every SSD Samsung has moved to 64-layer V-NAND has used TLC—even the high-end enterprise SSDs. With Samsung's Z-NAND covering the high-performance low-latency niche, Samsung may retire the use of MLC NAND from their more mainstream product lines. If Samsung is not planning to release an enthusiast-oriented Z-NAND product, then the PM981's retail counterpart may have to serve as successor to both the 960 EVO and 960 PRO. For this review, the primary comparisons will be against the Samsung 960 PRO and 960 EVO, the closest retail equivalents to Samsung's previous generation of client PCIe SSDs. Results for many other PCIe SSDs and a few SATA SSDs are included for comparison. Power measurements are still missing due to a recent equipment failure, but new and much better SSD power measurement equipment is on the way. "...the PM981 has caught up to or surpassed the MLC-based 96x drives on many tests, setting new records not just for TLC-based drives but for client SSDs as a whole." "...in order to squeeze out every cent worth of profit from that advantage." They are not, but it requires north of a simpleton's way of looking at it to see it. Because they could have kept MLC and offered a significant boost in performance thought the entire drive. And the claim that using TLC it catches up on MLC drives is just nonsense. There is no engineering miracle here. There is simple caching at play, the drive doesn't touch TLC for the duration of AT's flimsy test suite. Once the drive runs out of cache performance quickly gets abysmal - about 750 mb/s once it gets to the point of using TLC directly. Not to mention the reduced endurance. Granted most casual consumers won't be doing anything as data intensive, but many prosumers will, which means that current consumer grade drives are no longer adequate for prosumer applications, which wasn't the case with the previous generation, indicating that samsung is indeed taking a step back. And things are not looking too well in the more affordable enterprise range neither, its lousy with TLC as well. Meaning that samsungs devolution now forces prosumers to shop for the much more expensive high-end enterprise storage solutions. "There is simple caching at play, the drive doesn't touch TLC for the duration of AT's flimsy test suite." Queue depth is 50% 1 depth.